Who knew something so simple could be so difficult to perform . . . and on such a regular basis. It’s one of the simplest movements a person can perform and yet, so many people perform it incorrectly. The amount of damage being done from this improper movement is causing massive amounts of pain and suffering with the aging older adult years down the road. Personal trainers are on the front line of the health and wellness frontier, and it falls on us to educate and instruct our clients about why it’s so important to perform this movement correctly. It’s up to us to show them how to do it. Once armed with the understanding of how and why, it’s our hope that our clients will continue to use proper technique in all areas of life, not just in the weight room. The movement I’m referring to is called a transfer. A proper transfer takes time and patience to teach, however, its vitally important to the longevity of our older adult clients and the maintenance or improvement of their quality of life. 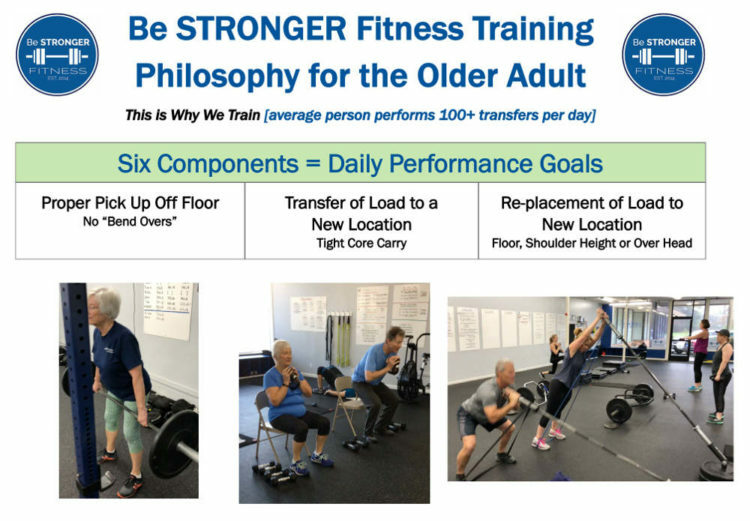 For years now, in our older adult personal training studio, we have been working with our clients on the idea of properly picking up, carrying and putting things down—not only in the weight room but also in their daily lives. We see this occurrence often in our daily workouts when a client is asked to perform ten repetitions of a kettlebell deadlift. They perform nine and a half perfect deadlifts and on the last rep they round their back and bend over to return the weight to the floor. After a reminder of putting the weight down properly the client then picks the weight up and carries back to its stored location (carried transfer) only to perform the improper bend over again during the replacement of the weight. This leaves us shaking our heads trying to figure out how we can properly coach this movement in the weight room and in our client’s life outside of the weight room as they continue to pick things up, transfer them and place them in a new location. While seemingly simple, performing a transfer correctly is a difficult task to recreate on a regular basis. This difficulty is primarily due to improper movement patterns and the lack of attention to proper mechanics. The most common mistake we see with transfers is the “bend-over” (rounding of the lumbar spine) upon pick up or replacement of the load. Our clients have a general understanding that they should not pick things up using “their back” and in fear of doing so they use a vertical torso position in hopes of saving their lumbar spine. This position allows their knees to jet out in front of their toes placing vertical pressure on their spine and a great deal of load on their knees. Not only is the back exposed to injury, but the knees are as well. Osteoarthritis and spinal stenosis are two of the most common lower back injuries for older adults and are caused by gradual breakdown of the cartilage between the facet joints of the spine. This breakdown can be traced back to excessive and improper overuse of the spine as seen in rounding of the lumbar spine and improper lifting mechanics or bracing of the spine with heavier loads. This degeneration can lead to multiple injuries including chronic lower back pain, sciatica, numbness or drop foot, just to name a few. To avoid these types of injuries to the spine we teach our older adult clients how to hinge squat. The hinge squat focuses on their ability to displace their hips back as far as possible until they feel their hamstrings stretch (eccentrically loaded). Once this stretch has occurred they can then bend their knees lowering their hinged body position towards the floor. This is what we call a properly loaded back: ready to pick up, transfer and replace weight. Though simple, this can take years for clients to regularly perform correctly. Some clients may be lacking the mobility and strength required to perform this movement correctly and will need to develop their hinging skills from the floor first (glute bridge, hip thrust, etc.) and increase their hip flexor, glute and hamstring flexibility to allow the depth required to hinge squat appropriately. Earlier this year, I found myself repeatedly asking my clients to not bend over when picking up or putting down their weights. As my frustration grew I went to my whiteboard and started tallying every time I saw someone bend over incorrectly. By the end of a five-hour training cycle my 26 clients had bent over 133 times. These were just the bend overs that I saw in between coaching lifts, cueing movements, instructing correctives and walking the floor. I’m pretty sure I missed many more. 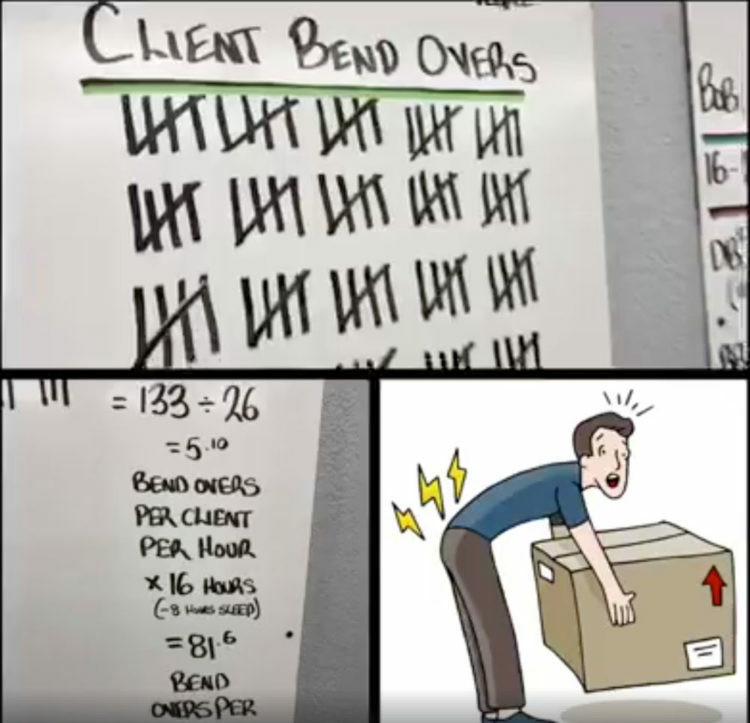 On average, each client bent over five times per hour. Most people are awake around 16 hours per day producing at least 80 opportunities for an increased risk of injury to occur when picking up and moving loads incorrectly. One of the largest concerns we have with the transfer is the proper pick up. We call a bend-over (round lumbar spine) pick up an “exposed” lower back position in which it is left in a vulnerable angle, or unbalanced position when attempting to perform the lift. People get in a hurry, they don’t think about their positions and are concerned about accomplishing their task quickly. Quick mindless movements often lead to injury. This situation can be minimized if the client were to literally take one or two extra seconds prior to each pick up to align their bodies and hinge appropriately. However, in many cases we find that they don’t. I like to explain the structure of the lower back and hips and how they function to my clients in this way: I think of the spine as a new copper wire. It has no blemishes, functions perfectly and is ready to perform its job without the fear of failure. As the copper wire is repeatedly bent, molded and warped in awkward positions beyond a safe range of motion or under excessive load it begins to fail. Eventually, with limited warning, the copper wire will simply break. The most commonly injured area in the human body is to the lower back and the internal damage from repeated bend overs may not appear to the naked eye, but the builds over a lifetime. One day, and with limited warning, the lower back will give. Injuries can range from a standard “throwing out” the lower back (muscle strain) to as severe as a “ruptured disc” that requires immediate attention or surgery. 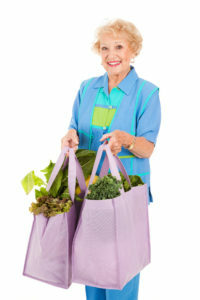 A great example of a “loaded carry” is an activity that is performed by almost every person in America on a weekly basis: transferring the groceries from the car into the kitchen. This transfer, for older adults, can be a daunting task and possibly a high-risk activity for them to perform due to the lack of strength and conditioning required to do so correctly. The challenge comes from the many variables in each client’s environment. What I mean by “environment,” is that it’s rare for a client to have a straight shot from their car to their kitchen with no obstructions or obstacles in which they must maneuver through or around. They have corners to negotiate, steps to climb, hallways to turn sideways and shimmy down, locks to unlock and doors to open . . . all while carrying heavy and/or uneven loads. Uneven loads are another challenge for the older adult to bear, as the overload of weight can develop unilateral dominance and increase the risk of injury. Unilateral dominance is developed when a client has a bag in each hand however, as they approach the door they place the load being held in their dominant hand into their non-dominant hand to allow their more dexterous arm to be free. The non-dominant hand (left arm if they are right handed) holds all the load, leading to the development of unilateral dominance on that side. This allows the more coordinated arm (right arm) to be free to perform more dexterous movements, like unlocking the door with their keys, opening the door, turning off the alarm or greeting their dog. When carrying heavy or uneven loads up, down and around obstacles, reducing the amount of up and down deviation (bouncing), lateral shifting (lumbering) movement or swinging of the load forward and backwards becomes a priority. Reducing these mistakes allows the load to be transferred long distances safely. A quick foot tempo with a slightly shorter with a tightly contracted trunk while carrying the load is what classifies the movement as a “carrying” vs. a normal stride, tension and tempo of walking. Consider this example when teaching the “carry” gait compared to a “walking” stride. Imagine carrying two large buckets of water filled to the brim 100 meters over a glass bridge. This would require small, smooth and calm strides with controlled movement to increase the likelihood of successfully transferring that load quickly and correctly without spilling and without cracking or breaking the bridge. Once the load has been properly picked up and transferred to a new or final destination the client will then “re-place” the load, typically back on the floor, at hip height, at shoulder height or above the shoulder (overhead). If returning the load to the floor the client will perform the “proper pick up” in reverse order, allowing for a safe hinge squat to the floor to de-load the weight before returning without the load. If returning the weight to hip height, the client will keep their core tight while shrugging from the shoulders to allow for elevation of the load to be placed in its new location. Shoulder height returns require a row and turn-over (hang power clean) of the weight to allow a safe transfer of the load from hip height to shoulder height before replacing the load. Finally, heaving the load overhead comes after the row and turn-over (hang power clean) and is accompanied by a dip and drive of the hips allowing for some momentum to be transitioned to the weight as its pushed over head to be replaced. The average person will perform over 100 transfers per day. These transfers can range in difficulty from simple act of picking up laundry off the floor, carrying it to the basket and placing inside to more difficult movements like picking up a box full of books, carrying it to the office, heaving it overhead and placing it on the bookshelf. Transfers occur more than we think, and like the copper wire, damage can occur if these transfers are performed often, while in improper positions or with excessive loads. It’s with this mindset that we teach our clients how to properly transfer load. Transfers are going to happen and a proper transfer includes a good hinge to pick up a load, correct carrying technique to transfer it to a new location and to replace that load appropriately with perfect technique. It’s my hope that when I’m not present to remind them, they will take this practice into their daily lives with every transfer they perform. Our goal is to preserve their lower back, hips, knees and shoulders allowing them to move well, to be strong and live a pain-free lifestyle as long as possible. In this lecture, Understanding Low Back Pain: Functional Anatomy Interventions and Prevention, Eric Beard covers the anatomy of the low back and discusses the causes of chronic back pain. This Over My Head collection rounds out what Dan considers his three-part mission to get athletes to drag stuff, pick stuff off the ground and carry stuff overhead. 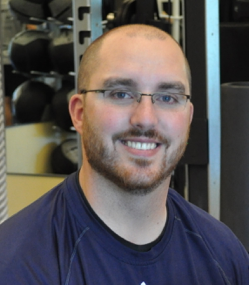 This intriguing conversation, recorded at the Perform Better Chicago conference July 2012 between Stuart McGill and Craig Liebenson, gives us a glimpse into the recent and forthcoming back pain research coming out of Dr. McGill's Spine Biomechanics Lab. Nearly everyone knows the feeling of low back pain, and many people suffer chronic back pain for years. Sam Visnic guides patients through the process of relieving low back pain, and in this lecture he tells both patients and therapists how to succeed where others might not.